OK, let me say right up front that this is NOT my idea. I did an altered CD swap at ATCsForAll.com recently, and it went so well, we’re doing another round. 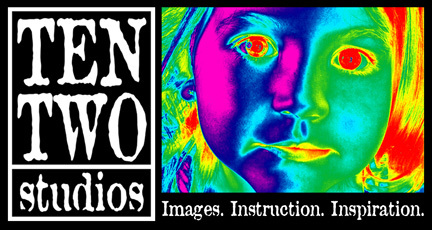 One of the ladies in the new swap posted a quick description of this technique, and it sounded so crazy, I jumped right up, grabbed some CDs and my camera, and gave it a whirl. 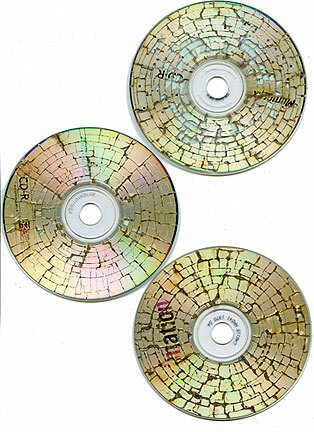 The three crispy CDs shown here are the first three I crackled. I should also say that this technique is very smelly, so it’s best done with the windows open. 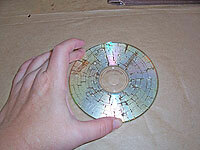 It also causes the surface of the CDs to spark for a few seconds, which is a little scary. Try this at your own risk, and don’t blame me if you burn the house down or have a heart attack! Having said all that, this is a pretty quick and hilarious technique, and it creates a lovely crackled surface, so it’s worth giving it a go with a fire extinguisher in one hand. Start with old CDs. 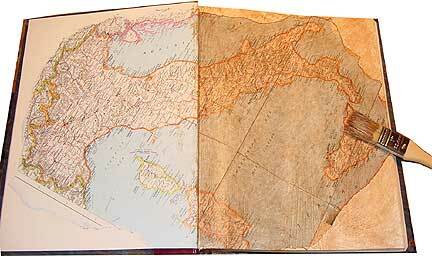 Mine were blank, without any label on them. 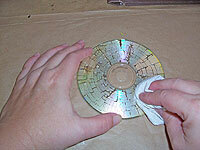 Don’t try this with CDs that have a paper label applied to them, because it really will catch on fire. 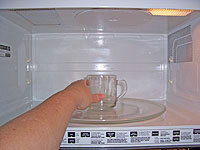 Put a microwave glass, cup, or small bowl in the center of the microwave. 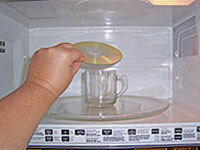 Don’t try this by putting the CDs flat on the floor of the microwave—they need to be lifted up a bit. Put a CD on top of the glass, with the metallic side up. Usually, the metallic side is the one that has some sort of brand logo on it. 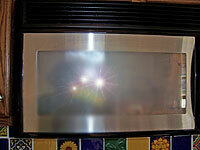 Close the microwave, say a silent prayer, and set the timer for 10 SECONDS. Seriously, 10, and only 10 seconds. Don’t leave it in there any longer. Press start, and step back. Nothing will happen for a few seconds, and then all of a sudden, there will be a bunch of flashes and sparks. 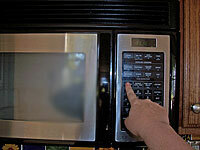 Don’t panic—this will stop as soon as the microwave shuts off. Pull the CD out. It will be warm, but not hot. 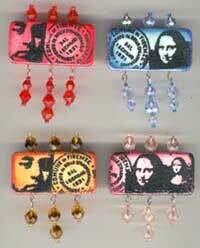 Lay it on a flat surface to cool. If it rippled a little while it was heating, you can press it flat while it’s still warm. Now, the CD surface is crackled. 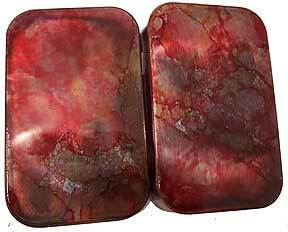 The metallic finish on the one side has split into tiny pieces. If you leave it alone, and just seal it with some acrylic varnish or Diamond Glaze, most of the metallic will stay where it is. 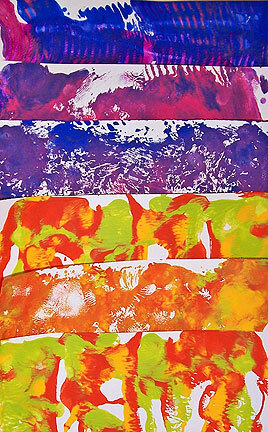 However, if you want some of those pieces to come off, just brush it with a paper towel a few times before you seal it. Whatever you do, seal it! I took these, unsealed, to lunch this week to show to Livia and Mary, and Livia had to pick little silver bits out of her Thai food after handling one. 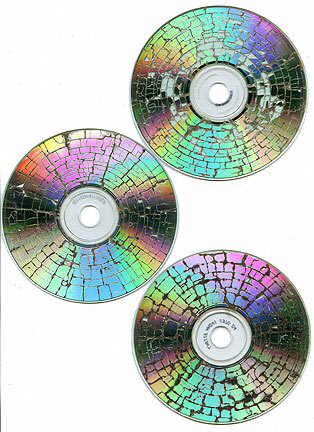 So, now I have crackled CDs—now what? Here’s a shot of the unsealed side, which is still smooth, and ready to accept some alcohol inks and a little collage goodness, which will probably be my next steps.